Paris may be famous for its bouquinistes, stalls selling second hand and antiquarian books lining the banks of the River Seine, but Colombo also has them. They don’t line the banks of the Beira Lake and tourists seldom find them but they are invaluable for the traveller. 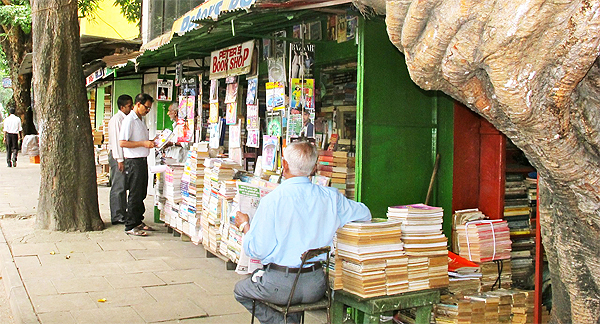 These wayside booksellers are to be found opposite the traffic island where D R Wijewardana Road meets T B Jayah Road, within walking distance from Maradana Railway Station. They are extremely useful for travellers because they not only stock old books and guides about Sri Lanka and many other countries but have thousands of books that can be bought or even borrowed. 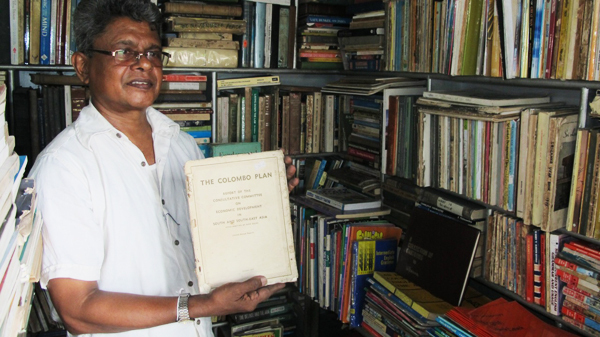 The street of bookstalls began in the 1950s when a young man from Matara, invalided out of the Royal Navy, took to collecting books from British planters who were abandoning their bungalows, and offering them for sale on the streets of Colombo. He soon realised he needed a permanent base for his collection of books, and that’s when he arrived at Maradana, later setting up in D R Wijewardana Mawatha. 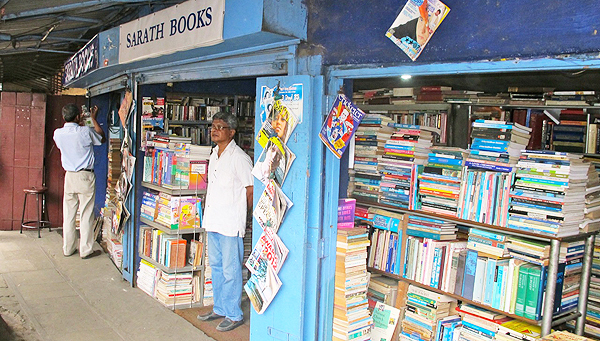 His original shop is no longer there but his nephew, Sarath Thewarahennadi, also from Matara, is – and he runs Sarath Books. There are now seven second-hand bookstalls on the same corner. While all the shops stock general books, each one has its own speciality. One shop presents a wall of paperbacks catering for the mass market, another specialises in magazines. At Sarath’s the emphasis is on textbooks, but he also has some rare old volumes, including the third edition of Robert Knox’s book on Ceylon originally published in 1681. Sarath knows the price of every volume he sells, and keeps prices low. He will even give a refund, less a reading charge, if someone buys a book and then returns it. This is the way he runs his own private lending library. Customers can deposit the cost price of a book and borrow it to read (at a reading fee of Rs100), and then collect the deposit when they return the book. The second-hand book business, even in the age of Kindle, remains brisk with Sarath selling over two dozen volumes a day. His customers are students seeking textbooks when the brand new editions are too expensive; Sri Lankans looking for a good read; researchers after a rare tome; and the occasional inquisitive tourist.Sarath and his colleagues welcome visitors to browse through their stock. They are open every day, except Poya (full moon) days, from 9am to 5pm. 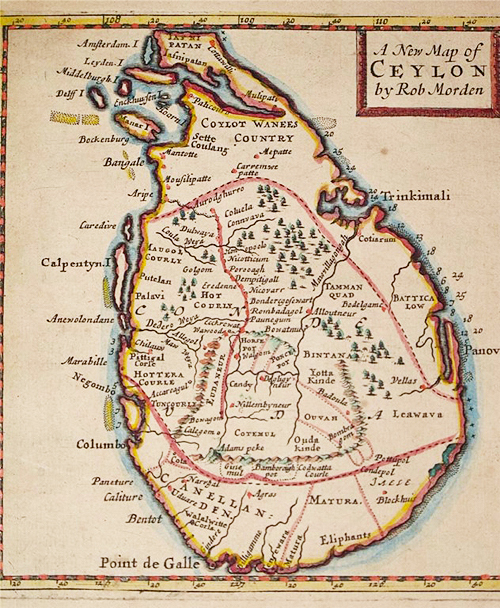 While maps of Sri Lanka are readily available for the traveller (check the monthly magazine Explore Sri Lanka for a free copy) ancient maps are rare collectors’ items. I have been collecting them for years usually from British map dealers and was thrilled to find recently an original print dated 1688 of a map drawn by Robert Morden. Robert Morden (c.1650-1703) was a British bookseller, publisher, and maker of maps and globes. He was among the first successful commercial map makers. He is famous for his maps of the English Counties published in a new edition of Camden’s “Britannia” in 1695. Each had a decorated cartouche and showed numerous place names. In 1701 Morden published a series of smaller county maps often known as Miniature Mordens. He also produced a series of miniature maps of the world, which appeared in both playing card format and in a series of atlases, including his Atlas Terrestris and Geography Anatomiz’d, beginning in 1687. That’s probably the source of my map, a copper engraving with later hand colouring. It’s remarkable for its detail and captions (in English) and for referring to Sri Lanka as Ceylon a century before the British arrived. It also shows the original Tamil homeland, Coylot Wanees Country stretching from Jaffna to Batticaloa. Not shown on the map, or on any modern map yet, is the newly built Airport Expressway that opened to much fanfare (including elephant rides and bullock cart races) on Sunday 27 October 2013. The Expressway is reached from the Bandaranaike International Airport along the established Canada Friendship Road a new interchange at Katunayake. It runs alongside the Negombo Lagoon, above the Muthurajawela Marshland to the suburb of Peliyagoda. From there it’s a mass of chaotic traffic before getting into Colombo or along the link road to the Southern Expressway at Kottawa, for speedy access to the southwest and south coasts. The fee per vehicle starts at Rs300 and the Expressway reduces the travel time between airport and Colombo suburbs to 20 minutes. Nuwara Eliya, at 6,199ft (1,899m) above sea level in Sri Lanka’s hill country, is often referred to as Little England, perhaps because of its unsettled weather. It can be crisply hot during the day, bitterly cold at night, and drenched in seasonal rains. Yet it has always had a homely atmosphere for visitors since its houses are mostly bungalows built by British colonials who made it popular as a healthy hill station retreat in the 19th & 20th centuries. A flower show is held there every April, and there are race meets on special holidays, a flourishing Golf Club, a Hill Club where male diners must wear ties, pony rides, a pink brick Victorian post office, and a mini botanical garden park in the centre of town. The original Sri Lankan beer, Lion Lager was first brewed there and the company’s beer shop still keep locals and adventurous tourists happy. It also serves delicious spicy chicken pieces at Rs750 for a huge plate. 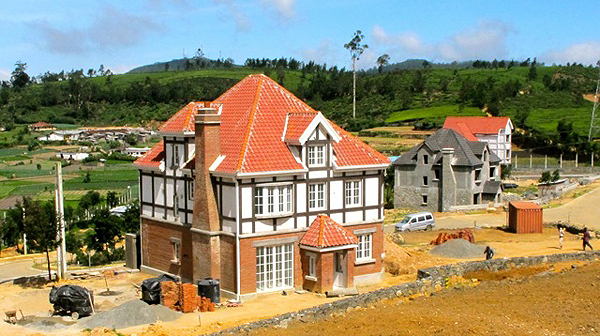 An enterprising hotelier, Vasantha Jayasuriya, the owner of the colonial style Glendower Hotel with its famous King Prawn Chinese Restaurant, is pioneering a housing development called Little England Cottages surrounded by tea bushes and forest just 10 minutes’ drive from the town centre. Copying the style of English mansions, manors and bungalows and building to strict British standards, he is creating a gated community for Sri Lankans returning from overseas and for Britons seeking a second – and familiar – home in Sri Lanka. Excellent article. Please keep me posted on regular articles like this.